Website visitor Jim S. wrote to request that I post this construction article on Larry Scarinzi's 'Gay Devil' control-line stunter model. Designed for a .29 to .35 size engine, the Gay Devil is an all built-up airframe, as were the vast majority of the models of the era. Undoubtedly its large elevator area, reminiscent to today's 3-D R/C models, is responsible for the designer's claim that it pulls through square-corner maneuvers with ease - and that is without flaps! Jim says, "I knew him [Larry] when we were attending Newark College of Engineering during the early 50's. I also saw him at Shaw Air Force Base in "57" where I helped launch his 'Gay Devil.' He won third place at that contest." This is yet another example of someone having the opportunity to wax nostalgic over experiences long, long ago. Designed by ex-Lockheed aircraft structures analyst (now with USAF) for .19 to .35 engines; spans 42"
Gay Devil control line stunt model airplane. Gay Devil fuselage former locations. 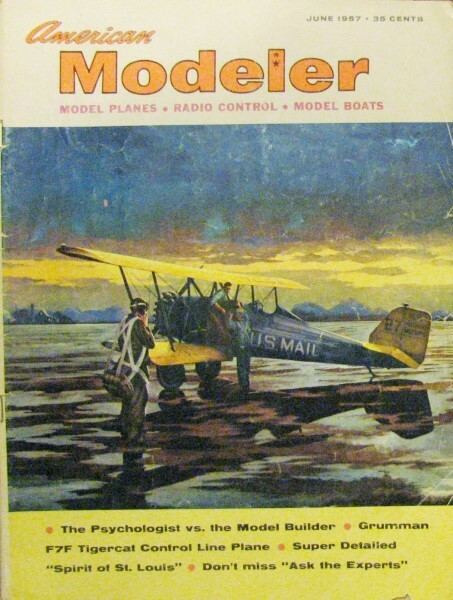 This model was designed to give the builder a stunter he can fly the "devil" out of without fear of losing a big investment in both time and money. It combines contest performance with unusual ease of flying. Everyone enjoys piloting a plane that performs and handles well. A quick glance at the plans will show that it is not the elaborately constructed and heavily doped stunt ship seen quite frequently; instead it is a down-to-earth design both aerodynamically and structurally. The transparent red finish is certainly appealing, especially to spectators, as it passes between them and the sun to show off the internal wing structure. We do not claim this model to be all new. Instead it reflects influences of other models observed over the years. Structurally it is different from the majority in that no leading edge sheeting is used and that the wing and fuselage are built as one unit, not separately. This technique represents a big saving in construction time. As for flying, Gay Devil is stable and nonsensitive; it will pull extremely tight maneuvers without loss of speed when a lot of control is used. It flies through squares and triangular loops with ease (to both flyer and model) and without hesitation or bounce. Its ability to perform well even when a sick or over-rich engine is used can be attributed to proper "moments," correct wire and control rigging, precise balance and sufficient wing area to carry the light weight of this model. 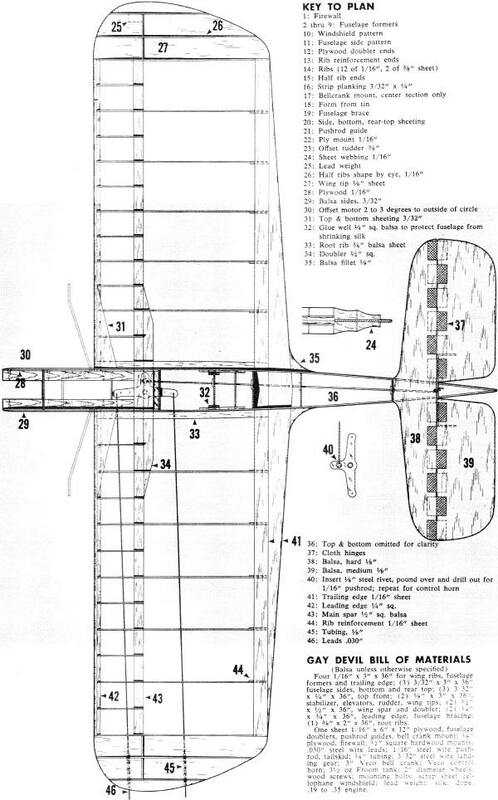 Before starting construction study the plans and familiarize yourself with the method of wing-fuselage construction. Fasten the motor mounts to the 1/16" plywood doublers with glue and small wood screws. After this join these doublers to the 3/32" medium sheet balsa fuselage sides. If a transparent finish is to be applied, use quarter-grained balsa on exposed wood areas for a colorful effect. When dry join the fuselage sides at the tail, firewall and former F-6. Pick a strong, straight grained piece of 1/2" square balsa for the main spar. Pre-glue the 1/2" square balsa doubler and adjacent area of the main spar, then glue together. Cut out wing ribs and trailing edge from 1/16" sheet. Use medium-hard stock for the trailing edge. Slide the main spar in place leaving inboard wing 1" longer, align carefully and glue. Now you are ready to assemble a model in jig-time. Insert the root ribs and leading edge. Position ribs on main spar and glue lightly. Cement either top or bottom of the trailing edge in place, allow to dry. Slide other half of trailing edge in place and glue. Before this is thoroughly dry, remove any minor warps by twisting. Now go over all ribs and glue permanently. Assemble tips as shown, forming tip ribs by positioning scrap balsa; shape with a sanding block. That section of 1/4" square balsa leading edge inside fuselage may now be cut out to allow room for the gas tank. Install 1/16" ply pieces in center section of wing; mount a large bell crank. Slide the 1/2" square plywood pushrod guides in place, mount the horizontal tail. Install lead-outs to complete the control system. To finish, add remaining fuselage formers, gas tank (3 1/2 oz. 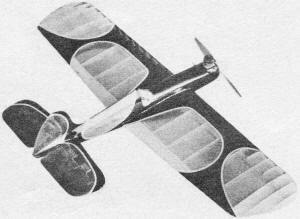 Froom was used in original), landing gear, rudder, top and bottom covering. For reasons of strength, cover wings with red silk. My original model was finished with 10 coats of clear fuel-proof dope followed by 2 coats of Aero-Gloss Fire Red. This transparent red color over quarter-grained balsa will give a bright furniture-like finish. Clear dope wing to a bright finish. Nose section was trimmed in black with a gold pin stripe.